A musical episode certainly makes more sense for Once Upon A Time than it does for most other shows (hospital series like Scrubs and Grey’s Anatomy, say), which may be one reason why “The Song In Your Heart” is more successful than most. Another reason is that most of the cast was up to the task, especially Ginnifer Goodwin and Josh Dallas, tasked with kicking off the episode, inspired by Disney-ready singing bluebirds. Obviously, the most “Powerful Magic” of all was going to be love, but there’s something fun about Charming striding into a room, enjoying how his voice is soaring. The songs, all written by Alan Zachary and Michael Weiner, creators of the Disney stage musical Twice Charmed, all have that Disney stage/would work well on a Disney cruise ship feel. Which, considering they’re all original songs written in a matter of weeks, probably, is also impressive. Maybe Lana Parrilla’s voice suffers from having to be immediately compared to Goodwin and Dallas, but it’s pretty clear that “Love Doesn’t Stand A Chance” was written to help out her lower-register vocal. Still, she makes the most of it, with the Evil Queen in a fairly straightforward Frank N. Furter homage, rifling through everyone else’s happy singing moments (ripping Granny’s knitting seemed especially egregious). The Evil Queen may have moved on from Storybrooke, but these flashbacks give her a chance to reappear now and again, which is fun for Parrilla, who totally takes advantage by vamping it up here as much as possible. But she is outshone by the musical episode’s standout: Rebecce Mader’s “Wicked Always Wins” gets the best song here, and subsequently the best performance. She’s aided here by some inspired lyrics (“what they call green wth envy / I call looking good”), and again a chance to see old-school green-skinned Zelena, which we don’t really get to see anymore. Was so good it made the musical scenes that bookended it, Hook’s snappy revenge song and the Charmings’ sing-off against the Evil Queen, seem schlocky. Colin O’Donoghue also fared well with his singing voice, but his song was cheerful where it should have been menacing. That sing-off, though: hoo boy, certainly the low point of the entire enterprise. By that point, we became sick of these songs we’d only just heard. Although nice touch for Regina to defeat the pair with some mysterious help from her sister, mercifully putting an end to one of the silliest battles we’ve ever seen on this show. So Emma has had a song in her heart that can help her defeat the Evil Queen. For a musical episode, even the curse, and the reasoning behind it, wasn’t as far-fetched as it could have been. There’s a little far-fetchedness in the number that ends the episode, “Happy Beginnings,” as Emma and Hook inexplicably burst into song at the end, but that’s what musicals are all about anyway, right? Nobody really bursts into song after kissing is girl good night and walking home in the rain. The final number loses some points for just out-and-out corniness, on an odd, artificial stage set. The influence of a La La Land is prevalent here: Who were all those unfamiliar people in the wedding audience? Oh, just experienced dancers on hand with color-coordinate wardrobes to give the number more of a movie-musical feel. 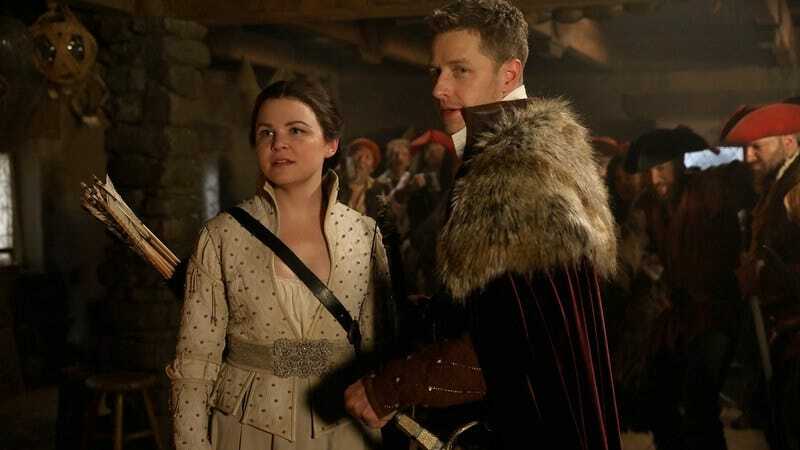 The biggest problem with the episode were the few logic holes it brought with it: If the spell means that everyone can only speak in song, why are Charming and Snow then about to talk to Hook? If the Black Fairy is only banished, not defeated, why does everyone forget about the Black Fairy’s curse, conveniently set to go off at 6 p.m.? Again, OUAT loves to pull out its favorite phrases, so there is a ton of talk about “The Final Battle,” next week’s episode title. In which things change forever or end forever, we just don’t know yet, but Emma looks appropriately flummoxed in the preview. Marah couldn’t join me tonight after all, so I decide to make these final two episodes full reviews. Agree that Robert Carlyle performing as old-school Rumple would have been a bit over-the-top, but it still would have been nice to get his singing inclusion in this. Nice fakeout though. Major props for the show finally remembering to invite baby Robin and baby Neal to the wedding! At least Grumpy’s always around to tell us when the curses have arrived. Emma’s wedding dress was based on Grace Kelly’s who was in fact a princess, albeit one with a very sad ending. At least it varied from all those strapless wedding gowns everyone else seems to be wearing. Two-hour finale next week. Weirdly, I usually like OUAT season finales, so we’ll see how it goes. See you then. UPDATE: Thanks to the commenter that posted this news this morning: Jennifer Morrison is out for season seven. Can’t imagine how they would go ahead with just Regina, Hook, and Rumple?